Next Post: Twinkled T – new vinyls! New Nail Polish – Polished by Alexandra! 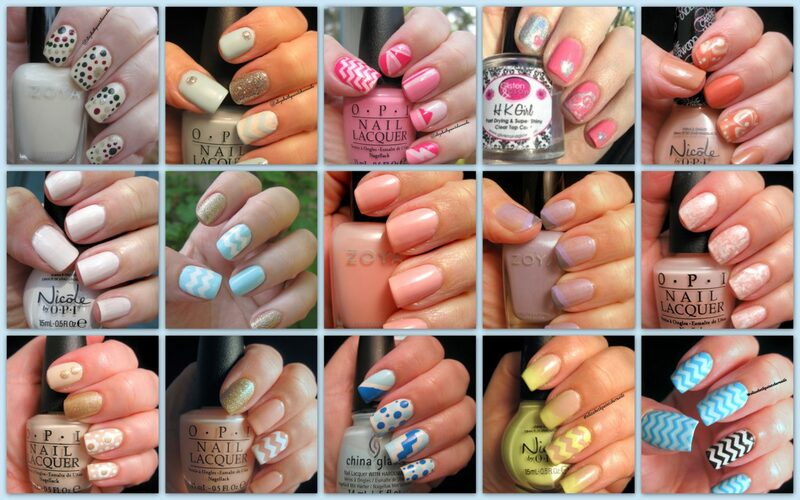 Insta-crack, or as it is called Instagram, is a great way to find new nail polish trends and indie polish brands. I have THREE new indie brands, but we are starting with Polished by Alexandra. I ordered her new collection, Seaside Carnival Collection. I received my purchase two days after I ordered! And no, I did not pay for express shipping. I have found small indie brands are usually ship very quickly! From left to right, I ordered Peach Salt Water Taffy, Cotton Candy Sunsets, Minty-Go-Round and Boardwalk Breeze. And I received a free lip balm!! I love free stuff, especially when I know I will use it!! This collection was a great change of pace! As much as I love those summer neons, I was thrilled to see this creamy summer collection! All four polishes had super, highly pigmented color (I hate when I think I am getting opaque polishes and I receive sheer offerings). The formula was great!! 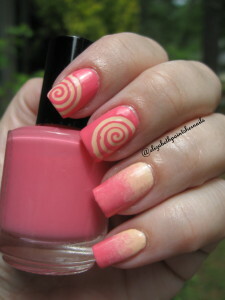 I had no problems, and BONUS – I could water marble with the colors! Whomp! Whomp! My hand went straight to Minty-Go-Round as soon I opened the package of goodies! I was not disappointed! I loved the way this color looks! So fresh and pretty!! I am dying to use this color again, but I want to stamp a ivory on top. I think that would be super feminine and pretty. My next polish was the lovely Peach Salt Water Taffy! This is a very cool color! Peach, with a healthy supply of cream really gives this color a shot of something a little different from your run of the mill peaches. It is a creamy peach goodness!! The formula again, was super! I used three coats, but I think I could have gotten away with two. I am just a three coat gal. I was pretty sure these colors would work well together, but holy hell – don’t you love the Peach Salt Water Taffy and Cotton Candy Sunsets! I did a gradient (or what I pass for a gradient) using these colors, and then added a very cool cyclone vinyl. But, I saved the best for last! I adored this last manicure! I love the color of Boardwalk Breeze! I could not resist trying to do a water marble! And I need to practice my skills, but I was happy with the way my ring finger turned out! And I added that old favorite, TGNAC (This Gown Needs a Crown) by OPI on my index finger! I made a commitment this summer to only purchase indie polishes. Besides getting cool polishes, you are supporting great ladies and their businesses!! Go check out Alexandra at Polished by Alexandra !! Posted: July 4, 2015 December 14, 2015 . Bookmark the permalink.